As China marks the 10-year anniversary of its first manned spaceflight, the nation is gearing up to launch its most complex robotic mission to the moon late this year. Ten years ago today (Oct. 15), China became the third nation — after the Soviet Union/Russia and the United States — to independently launch an astronaut to Earth orbit. A decade later, it's working to get a sophisticated robotic lander/rover mission called Chang’e 3 to the moon, with liftoff slated for sometime in December. The multi-step effort could help lead to the launching of Chinese astronauts to the moon’s surface, perhaps in the 2025-2030 timeframe. Chang'e 3 builds upon the success of China's lunar orbiters Chang'e 1 and Chang'e 2, which returned a catalog of lunar surface imagery and other data after launching in 2007 and 2010, respectively. For instance, researchers have created a high-definition image of Sinus Iridum, a plain of basaltic lava that has been targeted as one candidate landing spot for Chang’e 3 due to its flat topography and good condition of light. Liftoff of Chang’e 3, named after a Chinese lunar goddess, is to take place in December, according to the country’s media outlets. The moon-bound probe has arrived at Xichang city in southwest China’s Sichuan province, and its Long March rocket is going through final checks ahead of the mission's liftoff from the Xichang Satellite Launch Center. Zhao Xiaojin, director of the aerospace department of the China Aerospace Science and Technology Corporation, has said that once Chang’e 3 is in lunar orbit, the best landing site will be selected. Making use of optical and microwave sensors, the lander will make a soft touchdown on the lunar landscape, then deploy a 310-pound (140 kilograms), solar-powered rover that stands on six elastic mesh wheels. China has initiated a public campaign to name the moon rover, with the moniker to be unveiled in November after several judging rounds. Chang'e 3 lunar rover mobility testing was done in a desert locale of China. Chang’e 3 will power itself down onto the moon’s surface in a tricky maneuver. Li Benzheng, deputy chief designer of China’s lunar probe program, has said the rover will distinguish obstacles on the lunar surface and plot a path of least resistance by coupling onboard navigation systems with remote control. The instrument-toting rover, which is designed to record day/night temperature swings, will reconnoiter the moon for about three months, officials say. To help survive plunging temperatures at night, both the lander and rover carry radioisotope heater units and novel fluid loops. Along with terrain cameras, the Chang’e 3 lander is also outfitted with a near-ultraviolet astronomical telescope to observe stars, the galaxy and the universe from the moon, said Ouyang Ziyuan, a senior advisor to China's lunar program. Ouyang reported at the First Beijing International Forum on Lunar and Deep-space Exploration, held Sept. 3-6, that the lander also carries an extreme ultraviolet camera to survey Earth from the moon. He said that a radar system will be attached to the bottom of the rover to probe hundreds of feet beneath the moon’s surface. Chang'e 3 moon lander undergoes testing. "The Chang’e 3 mission makes use of a plethora of innovative technologies. It is an extremely difficult mission that carries great risk," said Ma Xingrui, head of China’s space exploration body and chief commander of the lunar program, as reported by China's state-run Xinhua news agency last month. The Chang’e 3 is a brand new spacecraft, loaded with technological advancements, space technologists Sun ZeZhou, Jia Yang and Zhang He wrote in a recent paper from the Beijing Institute of Spacecraft System Engineering. They reported that a number of breakthroughs were sought to achieve a soft landing on the moon and carry out rover operations, including landing-cushion subsystems, hardware for lunar night survival and integrated electronics and tracking and control technology. For example, the rover sports a stereo vision-based local autonomous obstacle-avoidance algorithm, they said. 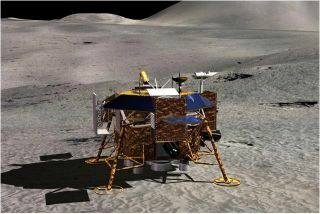 The engineers reported that extensive experimental verification work has been carried out for the Chang’e 3 mission, including hovering, obstacle-avoiding, and low-velocity descent testing, as well as landing-impact evaluations. Additionally, a rover teleoperation verification program was carried out in the desert regions of northwest China.